The nexus provisions of the Payroll Tax Act 2007 (the Act) determine in which Australian jurisdiction (State or Territory) payroll tax is to be paid. The nexus provisions were amended effective from 1 July 2009. This Revenue Ruling explains the nexus rules and clarifies the circumstances when wages must be declared in NSW for payroll tax purposes. It also clarifies the liability for wages paid for services performed outside all Australian jurisdictions. 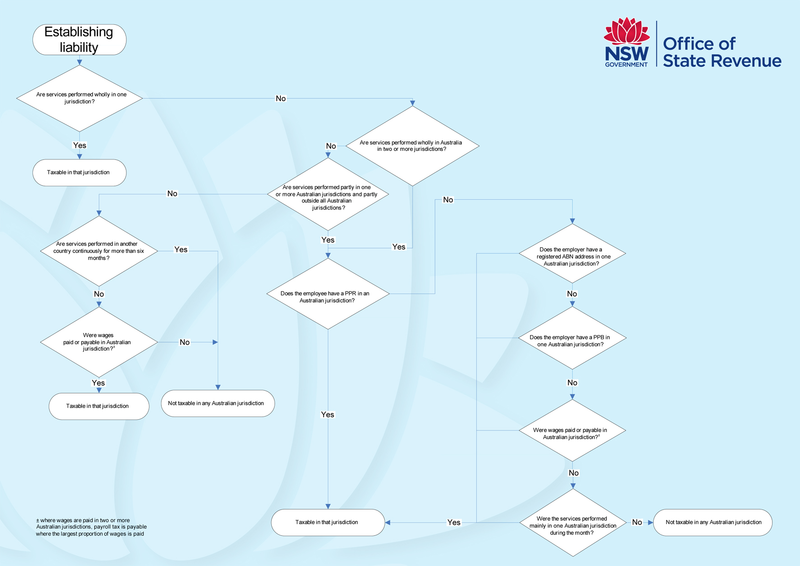 It should be read in conjunction with the attached Flowchart which explains how the various scenarios will be treated and shows the circumstances in which wages are taxable in NSW. Payroll tax is payable when an employer's total Australian wages exceed the payroll tax-free threshold (deduction amount). Australian wages comprise NSW wages and interstate wages. NSW wages are the wages subject to payroll tax under the Act. Interstate wages are those wages subject to payroll tax in the other jurisdictions under their equivalent payroll tax legislation. To determine whether the wages paid or payable in respect of each monthly return period are subject to NSW payroll tax, section 11of the Act firstly requires an employer to determine whether the employee has wholly performed services in NSW in a calendar month. Sections 11, 11A, 11B and 11C need to be applied by employers in determining where wages are liable for payroll tax. If services in a month are performed wholly in one jurisdiction, payroll tax is payable in that jurisdiction. Section 11(1)(a) considers the place where services are performed by the employee in the month that the wages are paid or payable even if that place is not where the employee usually performs services. For example, Joe normally performs his duties in NSW. In June 2010, he is sent to Victoria for a temporary project and performs all his services in Victoria that month. Wages paid to Joe in June 2010 for those services are liable to payroll tax in Victoria. the new nexus provisions provide four tiered tests for determining payroll tax liability. These tiered tests must be applied in sequence. Payroll tax is payable in the Australian jurisdiction in which the employee’s principal place of residence (PPR) is located in that month. If an employee has more than one PPR in that month, the employee’s PPR on the last day of that particular month is the one taken to be the PPR. In the case of a corporation that is deemed to be an employee under the Act (e.g. a corporation that is deemed to be an employee under the contractor provisions or under the employment agency provisions), the corporation’s PPR is taken to be in the jurisdiction where its ABN address is located or, if it does not have an ABN address, or has two or more ABN addresses in the jurisdiction, where its principal place of business (PPB) in Australia is located. If the corporate employee has more than one PPB in a month (e.g. where the corporate employee changes its PPB address part way through a month) the PPB is the address on the last day of that month.. If an employee does not have a PPR in an Australian jurisdiction during that month, payroll tax is payable in the jurisdiction where the employer’s ABN address is located. If the employer does not have an ABN address, or has two or more ABN addresses in different jurisdictions, payroll tax is payable in the jurisdiction where the employer’s PPB in Australia is located. If the employer has more than one PPB in a month (e.g. when an employer changes their PPB address part way through a month) the PPB is the address on the last day of that month. If the employee does not have a PPR in an Australian jurisdiction and the employer does not have an ABN address or a PPB in an Australian jurisdiction, payroll tax is payable in the jurisdiction where the wages are paid or payable. If wages are paid or payable in a number of jurisdictions, payroll tax is paid on the aggregate of the wages in the jurisdiction where the largest proportion of wages is paid. For example, Mary is employed by ABC Pty Ltd and Mary does not have a PPR in an Australian jurisdiction and ABC Pty Ltd does not have an ABN address or a PPB in an Australian jurisdiction during October 2010. Mary performs services in more than one jurisdiction and is remunerated for those services in NSW ($200), VIC ($300) and SA ($1000). The payments are aggregated and tax is payable on the total amount of $1500 in SA because that is where the largest proportion of wages is paid. If the employee does not have a PPR in an Australian jurisdiction and the employer does not have an ABN address or a PPB in an Australian jurisdiction and wages are not paid in an Australian jurisdiction, payroll tax is payable in NSW if the services were mainly performed in NSW during the month. Services are mainly performed in NSW if the actual time worked in NSW is more than 50 per cent during the month. Wages paid or payable in NSW to an employee performing services wholly in another country (or countries) (that is, an expatriate employee) for a period of up to six continuous months, are taxable in NSW. If only part of the wages earned by an expatriate employee is paid in NSW and the remaining part is paid in another country, the part of the wages paid in NSW must be declared for payroll tax. If the wages earned by the expatriate employee working in another country or countries is paid in more than one Australian jurisdiction, payroll tax is payable on the aggregate of the Australian wages in the jurisdiction where the largest proportion of wages is paid. Wages paid in NSW are exempt from payroll tax if the employee has performed services wholly in another country (or countries) for a continuous period of more than six months after wages were first paid for the employee for the services. The exemption includes wages paid for the first six months of service. The six month period does not have to be within the one financial year but must be a continuous period. to perform services exclusively related to the overseas assignment for a period of less than one month. If an employee returns to Australia in any other circumstances, the previous period of continuous service in another country is ended. A fresh period of continuous service starts again on the date that the employee recommences performing services in the other country. Wages paid in NSW for services performed wholly outside any Australian jurisdiction are taxable in NSW irrespective of the duration of the assignment. This would typically apply to oil rig workers. If wages are paid in more than one Australian jurisdiction, payroll tax is payable on the aggregate of the wages in the jurisdiction where the largest proportion of wages is paid. As the services are not performed in another country, the exemption for services provided outside all Australian jurisdictions for a continuous period of more than six months does not apply. When calculating the value of wages paid in a foreign currency, the Office of State Revenue will accept an exchange rate conversion, based upon the Reserve Bank of Australia's daily rate published for the day of payment or the yearly average rate for the financial year, as published by the Australian Taxation Office (ATO). The previous year's ATO figure may be applied for the purpose of making monthly returns, provided that the current year's rate is used to make an appropriate adjustment in the Annual Adjustment return. Section 11 also details a number of other factors that employers may need to take into account, in conjunction with the four tiered tests outlined above, in determining when and where their payroll tax liability arises. Wages paid by an employer to an employee in a particular month are deemed to be paid in relation to services performed by that employee in that month, even if the wages relate to services performed by an employee over several months (i.e. an annual bonus). For example, in June 2010 Peter was paid his usual $3000 wages for services performed in that month and also a $2000 bonus for services performed during the financial year ending June 2010. Even though the bonus payment relates to services performed for the whole financial year, it is deemed to be paid in relation to services performed by Peter in June. Therefore, only the services performed in June 2010 will be used in determining whether services were provided wholly in a jurisdiction or in more than one jurisdiction. If Peter performed services wholly in NSW in June 2010 payroll tax would be payable in NSW on the $5000 wages paid to Peter in that month, even though the bonus may relate to services provided by Peter in other jurisdictions during the financial year. If Peter provided services in more than one jurisdiction in June 2010, the four tiered tests are used to determine in which jurisdiction payroll tax would be payable. In most cases this would be the jurisdiction where Peter had his PPR in June 2010. If wages are paid in a different month from the month they are payable, liability arises in the earlier of the two months. For example, wages are paid to Bill in August 2010, but under his employment contract they should have been paid in May 2010. In May 2010, Bill performed services wholly in NSW. As May is the earlier month, payroll tax on the wages for his May services is payable in NSW even if Bill performed services wholly in Victoria in August. Any additional wages paid in August must be separately analysed. On the other hand, if Bill was paid in August 2010, in advance of his contractual entitlement to payment in September 2010, the wages would be liable in Victoria, where he provided services in August (being the earlier month). There may be instances where an employee receives two payments of wages from the same employer in one month where one amount is paid for services performed in one jurisdiction and the other amount is paid for services performed in another jurisdiction. For example, Rose receives wages of $1000 on 14 November 2010 for services performed in NSW. She receives another $2000 on 28 November 2010 from the same employer for services performed in Victoria. The two amounts are to be aggregated together and treated as if paid for all services performed by the employee in that month (i.e. in NSW and Victoria). Therefore, the four tiered tests are used to determine in which jurisdiction payroll tax is payable. In most cases, this will be the jurisdiction where Rose has her PPR. There may be situations where an employee does not perform services in the month that wages are paid. In such circumstances, the liability for payroll tax is determined by ascertaining where services were provided for that employer during the most recent prior month. For example, Jane is paid in the month of December but has not provided services to the employer in that month. The last month Jane provided services to that employer was October and those services were provided wholly in NSW. As such, payroll tax is payable in NSW for the wages paid to Jane in December. However, if Jane provided services in more than one jurisdiction in October, the payroll tax liability for the wages paid in December will be determined by using the four tiered tests. In most cases this will be the jurisdiction where her PPR was located in October. There may also be instances where wages are paid to an employee but no services have ever been performed by the employee for the employer. For the purposes of determining where the payroll tax is payable, services are deemed to have been performed at a place or places where it may be reasonably expected that the services will be performed. For example, if Jane accepts an offer of employment in August 2010 to commence work in NSW in November 2010 and receives a payment of wages in August 2010, Jane would be taken to have performed services in August 2010 in NSW (being the place it can be reasonably expected that services will be performed) and payroll tax on those wages would therefore be payable in NSW. Payroll tax liability for the grant of a share or option is also governed by the nexus rules contained in sections 11, 11A, 11B and 11C of the Act as well as section 26 of the Act. then the payroll tax liability for the shares or options will be determined by using the four tiered tests. For the purposes of test 3, section 26 of the Act identifies the place where wages constituted by the grant of the shares or options are taken to be paid or payable. If the share is a share in a NSW company or in the case of an option, an option to acquire shares in a NSW company, the relevant wages are taken to be paid in NSW. If the share or option is not in a NSW company, the relevant wages are taken to be paid outside NSW. any other body corporate that is incorporated under an Act of NSW. ABN address means the address for service of notices under the A New Tax System (Australian Business Number) Act 1999 (Cth), as shown in the Australian Business Register kept under that Act. Employee includes other persons to whom taxable wages are paid such as directors and contractors who are deemed employees. Month means a calendar month such as January, February etc.